Some tank owners add copper to their aquarium to prevent the growth of bacteria and parasites, like ich. 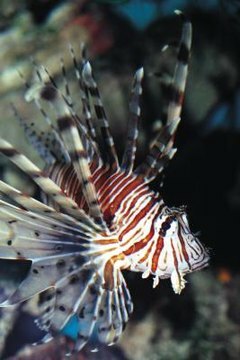 Copper in a saltwater aquarium may be tolerated by the fish, but is often detrimental to the other living creatures, like shrimp. Therefore, removing the excessive copper is essential for the health of your tank. Perform a partial water change of 20 to 30 percent. This generally helps lower the copper level in a saltwater aquarium. The tricky part is making sure your tap water does not contain copper before adding it to the tank. Turn on the cold water and let it flow out of your faucet for a couple of minutes before collecting it in a gallon-sized container. Allow it to set for at least 24 hours. Test the water with your copper test kit. If copper is present, pour out the water and do not use it. Visit your local fish supply store and purchase bottled water cleaned with a reverse osmosis, or RO/DI, system. Place an activated carbon block in the tank filter as directed by the manufacturer. Activated carbon, created from wood, coal and coconut shells, helps maintain the balance of waste, minerals and nutrients in a saltwater aquarium. The carbon absorbs copper and other harmful products from the salt water. Add a deionizing unit, which exchanges the ions, to your tank. Anionic and cationic ions created by the unit lower copper levels in saltwater tanks. While the anionic unit removes chemical compounds such as ammonia, the cationic part purifies the water further by targeting copper and lead. The DI unit also uses a carbon block to help clean the water in your tank.  Visit your local fish supply store and ask for assistance to determine which DI unit is best for your tank. Mr. Saltwater: Do you Really Need a RO/DI Unit?